The Annual Report for 2013 incorporates the newsletters published during the year. We are pleased to announce that the Survey was awarded a grant by the UK Arts and Humanities Research Council (AHRC) to extend the Web-based Platform for English Language Teaching and Learning in secondary schools (called Englicious) to primary schools. Team: Seth Mehl, Sean Wallis and Bas Aarts. In February 2012 Bas Aarts was awarded a Teaching Innovation Grant entitled Developing a suite of Apps for the Teaching of English Grammar. The funding was used to develop two new apps for handheld devices that complement the existing interactive Grammar of English: Academic Writing in English (AWE), and English Spelling and Punctuation (ESP). The apps will help students practise their skills in writing, spelling and punctuation. AWE was published in September 2013 in time for the new academic session, and ESP will be published in the spring of 2014. In early 2013, Cambridge University Press published The verb phrase in English: investigating recent change with corpora. The chapters in this volume feature new and groundbreaking research carried out by leading scholars and promising young researchers from around the world on recent changes in the English verb phrase. Drawing on authentic corpus data, the papers consider both spoken and written English in several genres. Each contribution pays particular attention to the methodologies used for investigating short-term patterns of change in English, with detailed discussions of controversies in this area. This cutting-edge collection is essential reading for historians of the English language, syntacticians and corpus linguists. David Crystal devotes an entire chapter to the Survey of English Usage in his new book Wordsmiths and Warriors: the English Language Tourist’s Guide to Britain, co-written with his wife Hilary Crystal. Sean Wallis’ blog on statistics for corpus linguistics, corp.ling.stats, continues to go from strength to strength in its second year, having garnered more than 15,000 page views and two Journal of Quantitative Linguistics papers to-date (see section 3 below). The medium of a blog has allowed Sean to collate explanatory material, powerpoint slides and spreadsheets, as well as more traditional academic papers. Colleagues are encouraged to review the blog (at http://corplingstats.wordpress.com) and add it to reading lists as you feel appropriate. 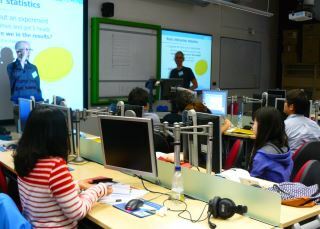 In 2013 the Survey organised our first Summer School in English Corpus Linguistics. We are pleased to report that following the success of last year’s event, we are repeating the Summer School this year from 7-9 July. 27 February: Sylvia Adamson: ‘Grammaticalisation and social stylistics: a case study’. 13 March: Tania Kuteva: ‘Evolution of grammar, complexity, and creoles’. 21 October, Seth Mehl: ‘Keywords within a model of semantic change’. 2 December, Marina Lambrou: ‘Narrative, Text and Time’. Aarts, B., J. Close, G. Leech and S.A. Wallis (2013) (eds.) The verb phrase in English: investigating recent change with corpora. Cambridge: Cambridge University Press. Aarts, B., J. Close, G. Leech and S.A. Wallis (2013) ‘Introduction’. In: B. Aarts, J. Close, G. Leech and S.A. Wallis (2013) (eds.). 1-13. Aarts, B., J. Close and S.A. Wallis (2013) ‘Choices over time: methodological issues in current change’. In: B. Aarts, J. Close, G. Leech and S.A. Wallis (2013) (eds.). 14-43. Aijmer, K. (2013) Understanding pragmatic markers: a variational pragmatic approach. Edinburgh: Edinburgh University Press. Bowie, J., S.A. Wallis and B. Aarts (2013) ‘The perfect in spoken British English’. In: B. Aarts, J. Close, G. Leech and S.A. Wallis (2013) (eds.). 318-352. Bowie, J. (2013) (With B. Aarts and S.A. Wallis.) ‘Exploring variation over time and text type’. Paper presented at the fifth Corpus Linguistics in the South meeting, Sussex University, 2013. Bowie, J. (2013) (With B. Aarts.) ‘Clause fragments in spoken English’. Paper presented at the 34th meeting of the International Computer Archive of Modern and Medieval English (ICAME), Santiago de Compostela, Spain, 2013. Bowie, J., S.A. Wallis and B. Aarts (2013) ‘Contemporary change in modal usage in spoken British English: mapping the impact of “genre”’. In: J.I. Marín-Arrese, M. Carretero, J.A. Hita and J. van der Auwera (2013) (eds.). 57-94. Collins, P. (2013) ‘Grammatical colloquialism and the English quasi-modals: a comparative study’. In: J.I. Marín-Arrese, M. Carretero, J.A. Hita and J. van der Auwera (2013) (eds.). 155-169. Davies, M. (2013) ‘Recent shifts with three nonfinite verbal complements in English: data from the 100-million word Times corpus (1920s-2000s)’. In: B. Aarts, J. Close, G. Leech and S.A. Wallis (2013) (eds.). 46-67. De Felice, R, (2013) ‘A corpus-based classification of commitments in Business English’. In: J. Romero-Trillo (ed. ), Yearbook of Corpus Linguistics and Pragmatics. Heidelberg/New York: Springer. 153-171. De Felice, R., J. Darby, A. Fisher, and D. Peplow (2013) ‘A classification scheme for annotating speech acts in a business email corpus’. ICAME Journal 37. 71-105. De Felice, R. (2013) ‘Corpus-based intercultural pragmatics’. Invited talk at the Corpus Linguistics in the South 6 Workshop, Portsmouth, UK, November 2013. De Felice, R. (2013) ‘The role of pragmatic annotation in correspondence corpora’. Paper presented at the Annotating Correspondence Corpora Workshop, Corpus Linguistics 2013, Lancaster, UK. De Felice, R. (2013) (with J. Bowie and S.A. Wallis) ‘Corpus pragmatics across genres: commitments in emails and spoken language’ . Paper presented at the 34th meeting of the International Computer Archive of Modern and Medieval English (ICAME), Santiago de Compostela, Spain, 2013. De Smet, H. (2013) Spreading patterns: diffusional change in the English system of complementation. Oxford: Oxford University Press. Duran Eppler, E. and G. Ozón (2013) English words and sentences: an introduction. Cambridge Introductions to the English Language. Cambridge: Cambridge University Press. Gries, S. Th. (2013) Statistics for linguistics with R: a practical introduction. Second edition. Berlin and New York: De Gruyter. Gries, S. Th. ‘Sources of variability relevant to the (cognitive) sociolinguist, and quantitative corpus methods to handle them’. Journal of Pragmatics 52.6. 5-16. Gries, S. Th. and J. Newman (2013) ‘Creating and using corpora’. In R. J. Podesva and D. Sharma (eds.). 257-287. Gries, S. Th. and S. Wulff (2013) ‘The genitive alternation in Chinese and German ESL learners: towards a multifactorial notion of context in learner corpus research’. International Journal of Corpus Linguistics 18.3. 327-356. Gut, U. and R. Fuchs (2013) ‘Progressive Aspect in Nigerian English’. Journal of English Linguistics. 41.3, 243-267. Hilpert, M. (2013) Constructional change in English: developments in allomorphy, word formation and syntax. Cambridge: Cambridge University Press. Kaltenböck, G. (2013) ‘The development of comment clauses’. In: B. Aarts, J. Close, G. Leech and S.A. Wallis (2013) (eds.). 286-317. Leech, G. (2013) ‘Where have all the modals gone? An essay on the declining frequency of core modal auxiliaries in recent standard English’. In: J.I. Marín-Arrese, M. Carretero, J.A. Hita and J. van der Auwera (2013) (eds.). 95-115. Marín-Arrese, J. I., M. Carretero, J. Arús Hita and J. van der Auwera (eds.) English modality: core, periphery and evidentiality. Topics in English Linguistics 81. Berlin and New York: De Gruyter. Mehl, S. (2013) ‘Contours of English and English language studies. Review of Michael Adams and Anne Curzan (eds.) Contours of English and English language studies. English Language and Linguistics 17.3. 571-6. Mehl, S. (2013) ‘Thinking linguistically about keywords: polysemy, semantic change and divergent identities’. The Keywords Project. Pittsburgh: University of Pittsburgh. » http://keywords.pitt.edu (PDF). Mehl, S. (2013) ‘Capital’. The Keywords Project. Pittsburgh: University of Pittsburgh. » http://keywords.pitt.edu (Keyword). Mehl, S., S.A. Wallis and B. Aarts Academic Writing in English (AWE). App for Apple and Android tablets and smartphones. London: Survey of English Usage. Mehl, S. (2013) ‘Take a mirror and take a look: reassessing usage of polysemic verbs with concrete and light senses’, Paper presented at Corpus Linguistics 2013, University of Lancaster. Mehl, S. (2013) ‘Keywords within a model of semantic change: vagueness, polysemy and the urgency of the debate’, Paper presented at the Survey of English Usage, UCL. Podesva, R.J. and D. Sharma (eds. ), Research methods in linguistics. Cambridge: Cambridge University Press. Romero-Trillo, J. (2013)(ed. ), Yearbook of Corpus Linguistics and Pragmatics. Dordrecht: Springer. Simon-Vandenbergen, A-M. (2013) ‘REALITY and related concepts: towards a semantic-pragmatic map of English adverbs’. In: J.I. Marín-Arrese, M. Carretero, J.A. Hita and J. van der Auwera (2013) (eds.). 253-280. Smith, N. and G. Leech (2013) ‘Verb structures in twentieth-century British English’. In: B. Aarts, J. Close, G. Leech and S.A. Wallis (2013) (eds.). 68-98. Varela Pérez, J. R. (2013) ‘Operator and negative contraction in spoken British English: a change in progress’. In: B. Aarts, J. Close, G. Leech and S.A. Wallis (2013) (eds.). 257-285. Wallis, S.A. (2013) ‘Capturing patterns of linguistic interaction in a parsed corpus’. Paper presented at the 34th meeting of the International Computer Archive of Modern and Medieval English (ICAME), Santiago de Compostela, Spain, 2013. Wallis, S.A. (2013) ‘The London Corpora’. Plenary presentation at the Greek Corpus 20 Workshop, National and Kapodistrian University of Athens. Wallis, S.A. (2013) ‘Statistics for variationists’. Paper presented at the fifth Corpus Linguistics in the South meeting, Sussex University, 2013.